Miranda – as all Wiinblad’s cats were called – was originally designed for Den Blå Fabrik, where Swedish artist Britta Drewsen lived and worked, and which Bjørn Wiinblad subsequently took over and converted into his renowned working artist’s residence in Lyngby. This adds a personal dimension to the new product launch for spring. 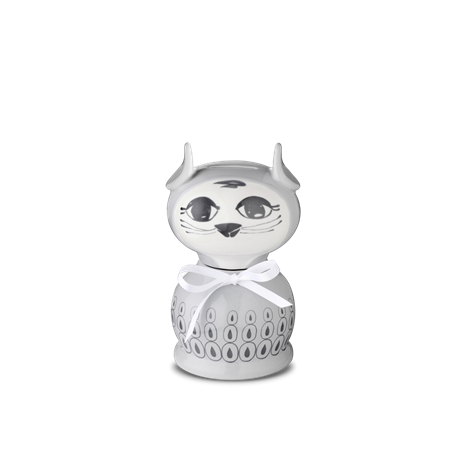 At the same time, Miranda the Money Cat reintroduces the classic piggy bank as a contemporary slow living object with ornamental value. Bjørn Wiinblad designed the Money Cat ‘kitty bank’ in 1969 and, 50 years on, the charismatic design continues to delight children and anyone with a soft spot for Wiinblad designs. Miranda’s naïve look nurtures a savings habit in little ones, and the accompanying pink or light blue ribbon helps customise the Money Cat as a christening or birthday gift. Miranda is also a great addition to the household as a handy, decorative way to store coins, car wash tokens or foreign currency left over from your holiday.